The botanical gardens, embellished with a motley of ornamental flowers and exotic plants, are perceived as jewels emblazoned in the picturesque land scape of the island. These gardens are a rich store house of a variety of flora collected from all across the world. From a casual inspection of a map it may appear that the tropical island of Sri Lanka is a mere adjunct of southern India; in reality there are many differences between the two countries, not least the stunning flora and fauna which demonstrate more affinities with south-east Asia than with the Indian subcontinent. Sri Lanka is a lush, verdant country in which plant growth flourishes; indeed it is often said that almost anything placed in the ground will grow within days! This attribute was fully exploited by the various colonists occupying the island over the centuries, and each in turn added to the diversity of species through their ornamental and commercial introductions. In this way an extraordinary flora has developed, rich in unique endemic species but also augmented by a myriad of additions from all corners of the world. 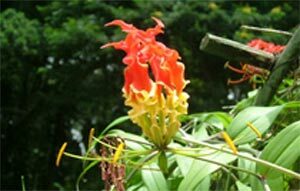 For many years our holidays have enabled hundreds of clients to enjoy the wonderful birdlife and natural history of Sri Lanka but this tour is the first to celebrate the island's flora, including not only native orchids and rare endemics but also trees and plants grown for their fruits or vegetables, and the oddities from around the globe which form the collections in Victorian botanical gardens. This will be a holiday for everyone with a love of the botanical world but, along the way, we will also encounter many of the endemic birds, colourful butterflies and more than a glimpse of Sri Lankan culture. This beautiful garden is situated in the serene Hill capital, Kandy. Located 4 miles off Kandy, the garden dates back to the reign of king Vikrama Bahu III, 14th century. Peradeniya is is home to a large variety of ornamental plants and other creepers that are used to produce the special spices of Sri Lanka. There is a flourishing growth of huge tropical trees along the lawns. But the orchid house is the prime attraction of this garden. Tourists will find more than 300 varieties of exquisite orchids blooming in profusion. The spice garden sustains trees and plants used for the traditional Ayurvedic medicine.The scenic splendour of the garden raised to ethereal heights by the Mahaweli river which flows through its fringes. Just 10 kms away from Nuwara Eliya City, it is the place where flora from far and wide are seen at home. The site has a mythical connotation with many believing that it was once the pleasure garden of the demon king Ravana of the epic Ramayana epic and the very place where the beautiful Sitha was hidden. It was only in 1860 that the present botanical garden was founded by the British botanist Dr. G.H.K. Thwaites. The exotic plants found in Hakgala include conifers and cedars from Australia, Bermuda and Japan, and cypresses from the Himalayas, China and as far flung places as Persia, Mexico and California. A special variety of pine was introduced from New Calendonia and there are specimens of this genus from the Canary Island as well. Another interesting tree that adorns this garden is an English oak, planted around 1890, in memory of the famous "hearts of oak" of Britain's naval power. In addition, there are , for the tourists' delight, the rose garden and the fernery. The garden will surely send a visitor into reverie. Nanu Oya is the nearest railway station. From here tourists can hire or taxis to Hakgala. Buses are also available, but they generally remain crowded.